However, one thing that always irked me was having to manually navigate to a certain folder after opening up a Bash shell in Cygwin. 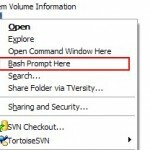 For Windows, there is a PowerToy called “Open Command Window Here”, that provides a context menu option for quickly opening a (Windows) command prompt with the location set to the selected folder. This is helpful, since you often have the folder open when you want to also have a command prompt at the same location. Now, all I needed was the equivalent function, but for the Cygwin Bash shell, instead of the Windows Command prompt. I did some searching and found a myriad of solutions to my problem, most of which were somewhat complicated. Thankfully, I did find one link that suggested an easier solution. Basically, here’s what you do. 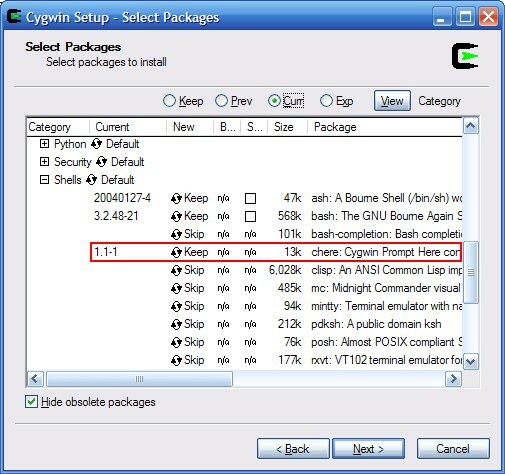 When you install Cygwin (of if you’ve already installed it, download it again and start setup again to run an update), make sure that you select the chere package under the “Shells” category. You should now see the following option in your folder’s context menu, and more importantly, it works! Error (5): Access is denied. This is the response I get, whats up? I had the same problem. 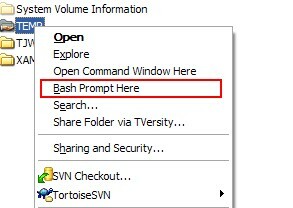 However, if you run Cygwin bash shell as admin you will have sufficient permissions to add the shell extension. Possibly the best thing I’ve seen this year! Good solid random geekery. Nice one. Thanks Peter! I just installed Cygwin and was searching for “Bash prompt here” and had forgotten how I had done it before. Great post! 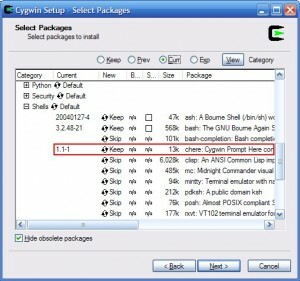 Elaborating on what dnorgaard said, you can hold down Ctrl+Shift (Windows 7) while clicking on a program icon in order to run it as an adminstrator. This fixed the “hive not writable” error for me. First up, awesome!!! thanks for that tip. From cygwin home dir, is there a way to setup a batch file with predefined locations so that I can get to where I need simply by launching that file? Nice tip. I use the ‘mintty’ terminal rather than the default. @puakv: You can use symbolic links. Thank you, saved me a lot of frustration. I didn’t know it was using mintty (or even what mintty is), but I really like how it handles resizing the window. Very helpful post, Mr Peter! 🙂 Straight and to the point. Windows 7 x64 (Russian) — works very well. Jerry I have the same problem. Thanks for this great tip! I’ve recently been forced at work to use a Win 7 PC instead of my trusty Linux Mint box and I’ve been missing my command line functions. This restores some of the convenience. If chere doesn’t appear in your list, you can use the script I made to do this.